Is there something out there in the world that you feel is owed to you? Have you "earned" a right to step in line ahead of someone else and claim the prize? Air travel is a regular part of my work and I love to sit and watch people approach the departure gate in the time before boarding. Occasionally I get a glimpse of someone trying to find a cheaper way to get bumped to the front of the plane. It's hilarious to watch their composure before, during and after their attempt. You can see their posture, facial expression and even how they utilize their wardrobe as they prepare to get what they want, a better lot than the rest of us. On a recent flight I saw it happen again and it reminded me of my distaste for this facet of our society. Over the years I have met many people who believe that they or or their family has done work, paid money, influenced, etc, etc such that they can benefit above others. What is hilarious though is to find out that behind the scenes, the actual cost of establishing this poise to strike at entitlement ahead of the masses is actually cheaper than one might assume. I have found its more about story telling (sometimes truthfully) than it is about personal sacrifice. Of course those of us sitting on the sidelines assume that they have done something to deserve this privilege but ironically what they have done to deserve it is deceive the rest of us. I think to wise advice I have heard (apparently from a rich man), that a rich man doesn't stay rich by wasting his money but a fool and his money are soon parted. Do we sit idly by and watch others claim greater privileges in our world because they are smooth talkers? Do we allow this to happen in our businesses, workplaces, churches, charities, sports events or government? Is it a fair reward for their acting skills? 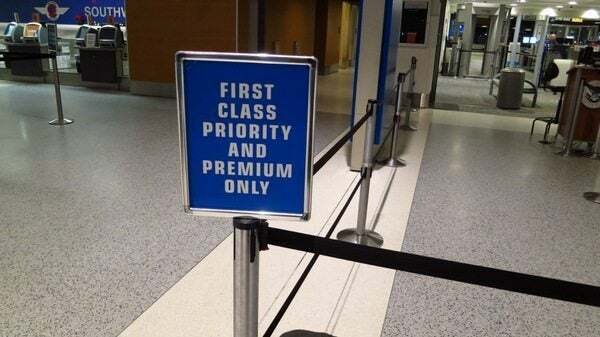 And yes, in the past I have smooth talked my way into executive class seating, but to be perfectly honest I stopped years ago and I tried to have a conversation with the person next to me and realized, I wasn't one of them.